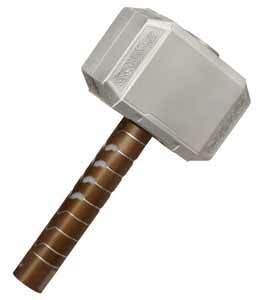 The Thor Thunder Clash Hammer is manufactured by the makers of Nerf and is basically a slightly remodelled version of the one that was released to coincide with the Thor movie. This one, however, is designed to appeal to fans of The Avengers movie. While not a bad sized toy, I did have a few issues with it. Firstly the RRP is a little on the steep side. £25 for a toy foam hammer is a bit cheeky, especially when you consider that it retails for around $10-15 (£6-9) in the USA. To be fair, I think a price tag of £15 would have probably been nearer the mark. When compared to other electronic releases in the range, the Hammer does very little. It only has one sound (as you'd expect - a thunder clap followed by rolling thunder) and lights up blue along parts of the handle and the round segment on the very top. 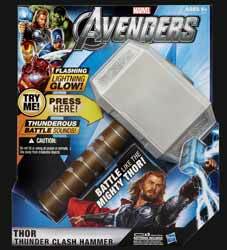 However, for Thor fans, this is a neat toy.